In this Review, we took a closer look at the best track saw on the market today for you, with a comprehensive tool test. We compared all the important factors like performance, design, power, and price so that you don’t have to. Whether you are a D.I.Y advocate or a seasoned professional, a good track saw is one of the best tools that you can add to your workshop. These sturdy, versatile power tools are perfect for making smooth, clean cuts in wood-based sheet materials. And, with the right blade, you can use your new track saw to make quick work out of lumber and other materials as well. View the Best Track Saw on the Market, Below. What Does a Track Saw Do? What Track Saw Blade Do You Need? What to Look for When Buying a Track Saw? But with so many models on the market, weeding through all of the different features, specs, prices, and reviews can be confusing. This can make narrowing down your options and figuring out which specific model you should buy seem like an impossible task. We have come up with our list of the top 8 tested track saws available today. Read through our review and buying guides, and we’re sure you’ll be able to decide which saw is best for your needs. We should also note, these products are great gift ideas for the D.I.Y practitioner in your life! Read on for our full tool test on these vital home improvement hand tools! One of the best tools in its class, the Makita SPJ6000J1 612inch Plunge Circular Saw with Guide Rail is a powerful, well-designed tool that offers incredibly impressive performance. This makita sp6000j delivers amazingly smooth, clean cuts through a variety of materials and was built to withstand years of heavy use. The SP6000J1 makita tracks saw features a 12 Amp motor capable of slicing through wood, melamine, flooring, and other materials with ease. And its electronic speed control helps to maintain a constant speed under load for more finished, tear-free results. A variable speed dial lets you match the cutting speed to your application and offers between 2,000 to 2,500 RPM. And a large cutting capacity of 2 3/16” at 90 degrees and 1 9/16” at 45 degrees is perfect for almost any job. An optional 55” anodized aluminum rail guide system ensures cutting accuracy and a sturdy magnesium build ensures that this plunge cut circular track saw, or compound miters, is lightweight but durable. With a 3mm scoring setting and the ability to make bevel cuts from -1to 48 degrees—with presets at 22.5 and 45 degrees—this is an incredibly versatile power tool. And thanks to its rubber overmold twin grips, it’s also surprisingly comfortable to use. See more information on Makita SP6000J1. Makita is known for building high-quality power tools and the SP6000J1 is no exception. It is lightweight but incredibly durable and offers more than enough power to tackle any application with ease. The ability to attach the optional 55” guide rail and make 3mm score depth cuts help to enhance the accuracy and quality of each cut. And the wide bevel range means that you can use this tool in a variety of home and professional projects. The Festool 561438 TS 75 EQ Plunge Cut Track Saw is one of the top performers on the market and is perfect for heavy duty use in the home or at the job site. An 8 ¼” cutting blade makes generous cuts through almost any material and, with the FastFix system, switching blades is incredibly easy to adjust, and safe. The 13 amp motor offers between 1,350 to 3,550 RPM and its soft start feature allows for perfectly precise cuts. Compatible with Festool hk guide rails, this plunge cutting circular saw is perfect for sheet cuts and the inclusion of a spring-loaded riving knife helps reduce kickback and ensures that your material doesn’t pinch the blade by keeping the cut kerf open. Festools tracks are heavy duty andhave a fantastic plunge cutting capacity making them easy to clean, precise cuts in the middle of any workpiece, which allows you to cut effectively for home improvement. Well-designed and sturdy, the Festool Track Saw has a maximum cutting depth scale of 2 ¼”, making it perfect for a variety of application. And with variable speed control and smooth control, it delivers clean burr-free and burn-free cuts that are immediately workable. At just over 13 lbs, it’s a heavy-duty power tool but its ergonomic design makes even prolonged use incredibly comfortable. See more information on Festool 561438 TS 75 EQ. At just under $800, this power tool is certainly one of the most expensive tested track saws featured on our list but it’s also one of the best on the market today. Delivering unrivaled power and precision, it’s capable of years of heavy professional use but is simple enough for even a beginner to use. Plus, its ability to tackle a variety of projects means that you have the capability of a circular saw and table saw in one lightweight package. Festool and Makita are both direct competitors - so it will be interesting to see which one you go for! Buying a versatile, powerful track saw doesn’t have to cost a fortune and the SHOP FOX W1835 is one of the best examples of an impressive power tool that is available at an affordable price. This circular plunge cutting saw is compatible with the SHOP FOX Guide Rail and can be used in a wide-variety of applications. With a 9 amp, 120 volt motor capable of an impressive no load cutting speed of up to 5,500 RPM, this compact powerhouse weighs only 11 lbs and features a low profile blade guard that allows you to cut as close as 5/8” from a wall. Perfect for trimming, plunge cutting, and sheet cutting, it’s a versatile option and the included riving knife offers more safety than conventional circular saws. The ability to cut at both 90 and 45 degrees means that you can use this saw for a number of household and jobsite applications. And a maximum cut depth positive stops of 2 5/32” at 90 degrees and 1 5/8” at 45 degrees means that this track saw can slice through most project materials with ease with track clamps. A comfortable handle allows for long use without user fatigue and a 1 ½” dust port lets you hook this tool up to a shop vacuum or dust collection system for a cleaner work area. See more information on SHOP FOX W1835. If you’re looking for an affordable price alternative to many of the pricier models out there, then the SHOP FOX W1835 is one of the best buys around. It is lightweight and easy to use but is perfect for trimming doors, cutting lumber, and slicing through sheet materials. With power and precision, it’s capable of delivering clean, precise cuts with ease and, at under $200, it’s one of the top deals on the market today. DEWALT has established their reputation for making durable, high-performance products and the DEWALT DWS520CK Track Saw is another addition to their impressive line of power tools. This zero clearance dewalt track saw delivers crisp, precise cuts and can be used with dual-edged tracks for straight cuts in both directions. Plus, its low-profile blade guard lets you use this tool in tight spaces that other models simply can’t reach. A powerful 12 amp, 1300 watt motor produces between 1,750 to 4,000 RPM and can slice through materials measuring up to 2 1/8” thick at 90 degrees and 1 5/8” at 45 degrees. Plus, a depth scale indicates the exact depth of your cut for more precise and consistent results. When using the dewalt dws520 with DEWALT’s anti-slip aluminum track, this power tool glides easily and smoothly thanks to four low-friction glide strips. And with the ability to make long straight cuts, quick cuts, and plunge cuts, this sturdy track saw can be used in practically any project at home or on the job. See more information on DEWALT DWS520K. The 11.5 lb DEWALT DWS520K is one of the top track saws in its class today. It is built with the rugged construction that the brand is known for while delivering impressive power and clean, finished results. 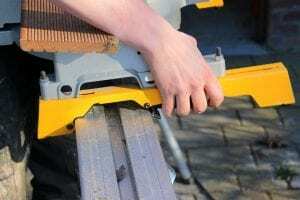 Plus, the fact that it can be used in place of a table, panel, or circular saw means that you have only have to carry one tool around instead of three. And at a little over $400, the dewalt dws520 is one of the top choices out there for serious DIYers and professionals - with no known current issue present! Lightweight and powerful, the Festool TS 55 REQ is one of the most impressive track saws on the market today. Delivering exceptional precision and versatility, it’s perfect for any workshop and gives you the ability to tackle a variety of jobs where a table, miter, or panel saw would normally be required. With a cutting speed from 2,000 to 5,200 RPM, the TS 55 is great for quickly cutting through practically any project material. And its riving knife ensures that your workpiece never binds, even during long sheet cuts. Plus, a plastic splinter guard ensures that every cut is clean, leaving instantly workable pieces. With a bevel tilt range of -1 to 47 degrees, this track saw is ideal for a variety of home and professional projects. And thanks to its flat housing, it can cut flush along any wall. Blade change is incredibly easy, requiring you to simply flip a locking lever, plunge the pro tool, and unscrew the arbor bolt. The easy to adjust micro-adjustment knobs allow you to fine-tune your cuts to match any application. And this model slides securely and smoothly along the included 55” track rail. There is also an accessory pack available with depth stop and depth adjustment. See more information on Festool TS 55 REQ. At just under $700, the Festool TS 55 REQ is an expensive option but is also one of the most popular options among professional woodworkers and tradesmen. It is impressively powerful and offers the speed and precision needed to tackle any job. Sturdy but weighing under 10 lbs, it’s one of the best saws for anyone looking for a versatile track saw that can take the place of a number of bulkier power tools crowding their workspace. The Grizzly T10687 is one of the top tested track saws in its class and offers the versatility and power that you’d expect from some of the pricier models on the market. Built to last, this 12.9 lb power tool is sturdy enough to withstand years of use while being light enough to use all day long. With a 9 amp, 120 volt motor that is capable of producing a cutting speed of up to 5,500 RPM, the T10687 is powerful enough to quickly cut through lumber, doors, trim, and sheet materials. And with an infinitely variable cutting depth of up to 2 5/32” at 90 degrees, it can cut through thick materials or even cut through several workpieces at once. A built-in riving knife prevents pinching of your workpiece as well as eliminating the risk of kick-back. And with bevel cutting and a dust port for debris control, it’s a well-designed model that you’ll be using again and again. Capable of making smooth, clean plunge cuts, quick cuts, and long cuts with the purchase of the optional Grizzly Guide Rail, it’s an incredibly versatile power tool to add to your arsenal. See more information on Grizzly T10687. If you’re looking for an affordable track saw that can tackle a wide-variety of applications in the home or workplace, the Grizzly T10687 is one of the best options out there. At just over $200, it is fairly inexpensive compared to other saws on the market while offering the power, speed, and precision that you need to achieve high-quality results. It doesn’t include guide rail clamps, so you’ll likely want to invest in one to enjoy the full potential of this tool but, for the money, it’s one of the top deals around. The build quality of this tool is beyond fantastic! The Triton TTS1400 is a sturdy, powerful track saw that provides the performance and versatility you need to tackle a variety of materials and applications, making it one of the best saws in its class. With a 12 amp, 1400-watt motor offering variable speed control and a soft start, it’s fast and precise, offering a speed range of 2,000 to 5,300 RPM. A bevel tilt range of 0 to 48 degrees allows you to handle limitless applications while its compact frame lets you cut at only 5/8” away from a wall. This model was designed with a barrel knob that lets you easily select from the plunge action cutting, scoring, and blade changing modes and an anti-kickback mechanism helps ensure safety when operating along a track. The universal vacuum system adapter can be rotated 360 degrees and its dual front and rear bevel quadrants give this saw improved stability. At 12 lbs, it’s a heavy, durable track saw but its two over mold grips offer user comfort, even during prolonged use. See more information on Triton TTS1400. The Triton TTS1400 is a powerful, versatile option capable of being used for both home improvement and professional projects. It makes crisp, accurate cuts and its bevel quadrants ensure stability. While you’ll likely want to purchase the optional accessories such as a guide rail in order to reap the true benefits of this versatile power tool, at around $300, it’s still one of the best purchases in its class. The DEWALT DCS520T1 is an impressive track saw that delivers high performance, precise cuts, and rugged durability. Plus, since it runs on the DEWALT 60V MAX rechargeable battery system, it’s cordless. With a no load speed between 1,750 to 4,000 RPM, this battery-operated power tool delivers power and performance that is comparable to many of its corded competitors. And with a bevel cut range from 0 to 47degrees and a maximum cut depth of 2 1/8”, it is the ideal tool for a wide variety of applications and materials. A continuous anti-kickback mechanism and riving knife prevents binding and eliminates the risks of kickbacks when operating along a track. And the enclosed low profile guard allows you to enjoy a 90% dust extraction capability for a cleaner work area. This model was designed for use with DEWALT’s dual edged tracks, which allow you to make perfectly straight cuts in both directions. And the straight plunge design allows for optimal ergonomics while gripping the comfortable overmold grip. Plus, it runs on the MAX FLEXVOLT 6.0 Ah rechargeable battery, which eliminates the need for an extension cord. See more information on DEWALT DCS520T1. If you’re looking for a cordless option, it’s hard to find a better option that this powerhouse from DEWALT. It offers great versatility and the power you need to tackle any home or professional project with ease. While it doesn’t include the guide rail that this track saw needs to reach its true potential, once you purchase the track, this saw will be able to replace your table, circular, miter, and panel saws on a variety of projects. And, since it’s built with the ruggedness you’d expect from DEWALT, you can count on this power tool withstanding years of heavy use. Track saws are similar to circular saws but can be mounted on a metal guide rail system, or track. Since the cutting blade runs along the track, this versatile power tool allows you to cut through sheets of materials such as doors, sheets of plywood, MDF, and melamine easily and accurately. 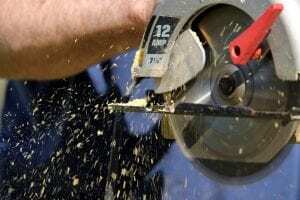 While they look similar to the more affordable price circular saw, these useful hand tools are designed to tackle tasks that a common circular model simply can’t handle. Looking for something else? See our guide on the top chop saws. The blade in a track saw retracts into a guard that only releases once you hit a lever that brings the motor assembly down into your work piece. This allows these saws to be used to make clean plunge cuts as well as enabling them to be used for more conventional cutting. This allows these saws to be used in place of a miter saw, table, panel, and circular saws (click for full guide). The main benefit of these models is that the base of the tool fits onto the channel of an aluminum guide rail, or track. Once secured, the tool can slide along this rail allowing the user to make precise, perfectly straight cuts even across long distances. Since the edge of the rails feature a pliable strip that supports your workpiece, it also reduces chipping along the cut line. This means that users can produce a more finished workpiece that doesn’t require sanding or finishing. And since you can angle the guide rail in any direction that you want, it’s also the perfect tool to use to miter across large sheet materials without having to deal with the angle limitations presented by panel and table saws. Since most models feature a soft start and a variable speed control, they are perfect for cutting through materials of various toughness and thickness such as sheets of plywood, cabinetry, lumber, melamine, and even doors and moldings. Another benefit is that most models feature a dust port that can be connected to a vacuum or dust collection system (dust extractor), allowing you to keep debris clear of your workpiece and your work area. Since they look so similar, it’s easy to confuse a track saw with a circular saw. But just because they look alike doesn’t mean they’re interchangeable. These tools are actually designed quite differently, allowing a track saw to tackle projects and tasks that a conventional circular model simply can’t handle. The track saw, also called a plunge saw, is one of the most popular tools among DIYers, professional woodworkers, and tradesmen. They cost considerably more than conventional circular saws but for a very good reason. Let’s take a look at the differences between these two kinds of power tools so that you can better understand why the plunge saw is such a versatile and impressive addition to any workshop. A circular saw is built with a motor, blade, base, and blade guard. When it’s time to cut a workpiece, you bring the blade close to the end of the object and adjust the depth of your cut by turning a knob that adjusts the base of the tool. When you cut, the guard retracts back out of the way, allowing the blade to perform the cutting. Unfortunately, circular saws present several disadvantages. The first issue is that you are forced to cut from the end of the workpiece, limiting the applications it can be used for. Also, since the blade side is open, these tools produce a significant amount of dust and debris. The final major drawback associated with circular saws is that they aren’t capable of making a smooth, splinter-free cut and making long, perfectly straight cuts is practically impossible. Track saws, on the other hand, are designed without a retractable blade guard since the blade is actually concealed within the machine itself. While it might seem like a minor difference, this design feature allows users of plunge saws to enjoy several impressive benefits. Since the blade is concealed within the tool, plunge saws can be used to plunge into any part of the material, not just at the end. And since the tool has a flat, smooth side, it can be guided flush against a wall or the floor. Also, these models are designed for easier cutting depth adjustments since you simply adjust a sliding mechanism at the front of the tool. Plunge saws also have three other benefits, specifically: safety, better dust collection, and cleaner results. Since the blade is concealed within the tool, accidents are less prone to happen with one of these tools than with a circular saw. Also, since most come with dust ports that can be connected to vacuums or dust collection systems, using one of these models is practically dust-free. Finally, these tools are designed to make accurate, precise cuts that don’t require much finishing and don’t have the jagged edges and splinters that circular saws produce. The final, and most significant, difference and benefit is the fact that plunge saws run along a track or guide rail. These rails come in a variety of lengths and feature a non-slip underside that prevents the guide from moving on your material. And since these rails have splinter guards on the cutting edge, they keep your material firmly in place. Because of this, you can move a track saw along even the longest span of material and produce a smooth, perfectly straight cut that requires virtually no finishing. Purchasing a blade for your new track saw is as simple as buying one for a conventional circular saw. The first thing that you need to find out is what size blade your tool is designed for. Most models use 612inch plunge track stock blades but there are some models that use larger blades such as 8 ½” blades. As far as the material that your blade is made from, there are several options available. The most common style is metallic alloy blades featuring a carbide tip. These blades are designed to withstand heavy use without excessive wear offering a longer blade life. The other benefit of carbide blades is that they resist heat so you don’t have to worry about burning your workpiece along the cut line. Now that you’ve determined the size and style of your blade, you need to consider the type of material that you plan on cutting. Blades with as few as 14 teeth are perfect for cutting through lumber or wood pieces. The downside is that, while they cut through workpieces quickly, the edge won’t be as finished. For work with sheet materials such as plywood and melamine, or if you want to achieve a smooth, finished cut, then your best bet is to purchase a blade with around 48 teeth. 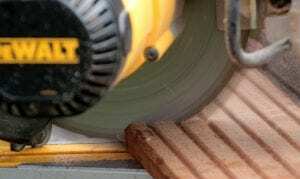 These blades will make finer cuts that won’t require any smoothing or sanding. When you’re on the market for a new track saw, there are a few factors that you should consider such as bevel capacity, maximum speed, and cord length. By looking at these three factors, you’ll be able to choose the perfect model for your needs. If you’re looking for gift ideas for the DIYer or professional in your life, you’ve come to the right place! The bevel capacity of your tool is simply its ability to cut at an angle. While some models only cut at 90 degrees, or straight down, other models allow you to make angled cuts. This feature will increase the versatility of your saw, allowing you to use it for a wider variety of projects. Models with bevel adjustment capabilities can have ranges as wide as -1 to 48 degrees. This means that it’s not only able to cut straight down, but also at angles that make it perfect for a wide-variety of projects and applications. For anyone looking to use their new track saw for a number of projects, the smart move is to purchase a model with a bevel adjustments that will allow it to tackle a variety of woodworking and other tasks. The speed that a saw’s blade spins is measured in RPMs, or revolutions per minute, also considered is the feet per minute in many cases. The average model has a minimum RPM of around 2,000, which is perfect for slicing through most thin workpieces. But one of the most significant benefits of a track saw is its versatility. And in order to make sure that your pro tool is capable of cutting through as wide a variety of materials as possible, you should look for a model with a wide RPM range. Many top models will have ranges up to 3,000 or even 5,000 RPM. This will allow you to tackle anything and choose from fast cuts or slower, finer results. A final thing to consider is the cord length of your new pro tool. You are going to be using your track saw along floors, walls, and guide rails. The last thing you want to do is have to mess with extension cords or realize that you can’t finish your cut because you ran out of cord. Ensure that the model you purchase has a cord that’s long enough to get the job done. Some models will come with power cords that measure only 8 feet while others can have cords that are up to 14 feet in length. Another option is to skip the need for a power cord altogether and purchase a cordless model. There are some very impressive battery-operated models that offer you total freedom and mobility. 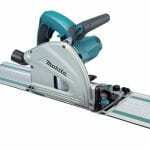 Our recommendation for the top pick on the market today is the Makita SP6000J1 6 ½” Plunge Circular Saw with Guide Rail. This powerful 12 amp model offers a slow start and a variable speed dial that opens it up to a wide-variety of materials and applications. With bevel cutting capability from -1 to 48 degrees, it’s incredibly versatile. And it glides smoothly along the included 55” anodized aluminum guide rail for perfectly precise long cuts. Designed with rubber overmold twin grips, this power tool is perfect for extended use. This track saw from Makita features a 3mm scoring ability which lets you make smooth, precise straight cuts every time. And its magnesium construction is lightweight but incredibly durable. At around $400, it’s simply one of the best models on the market today – with optional accessories too! Our pick for top premium choice on the market is the Festool 561438 TS 75 EQ Plunge track Cut Circular Saw. A large 8 ¼” cutting blade lets this powerhouse make perfect 2 ¼” deep cuts through a variety of materials. And thanks to its FastFix system, swapping out stock blades can be done in a matter of seconds. A 13 amp motor produces between 1,350 and 3,550 RPM of cutting speed and the soft start design ensures that every cut is accurate and clean. Variable speed control means you can fine-tune your blade’s velocity to perfectly match your material. And the spring-loaded riving knife prevents your work piece from binding and protects you from kickbacks. Built to deliver impressive performance in the home or at a construction site, this sturdy power tool weighs in at around 13 lbs. and can withstand years of heavy use. At just under $800, it’s one of the most expensive models featured in our list but it’s also one of the most popular options among experienced DIYers, contractors, and professional woodworkers on the market today. If you’re looking for a great value, our recommendation is the SHOP FOX W1835 Track Saw. This 9 amp, 120 volt power tool delivers a no load speed of up to 5,500 RPM and can perform precise cuts at 45 and 90 degrees. Designed with a riving knife that keeps the cut kerf open, this model prevents your work piece from binding on the cutting blade and eliminates the risk of kickback. And, thanks to its low profile blade guard, you can easily cut within 5/8” of any wall. A maximum cut depth of 2 5/32” allows you to tackle a variety of projects quickly and even lets you slice through several work pieces at once. With a dust port, sturdy design, and a comfortable grip, it’s a well-designed track saw that is perfect for any home renovation or woodworking project. And at under $200, it’s one of the top bargains on the market today. We hope you enjoyed our article on "The 8 Best Track Saws Reviewed", if so, please share and rate it.